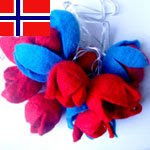 I was asked to make a typically Norvegian felted string light. This is what I ended up with. I kind of like the bold association of red and blue on the white wall. On m´a demandé de faire une série lumineuse en feutre typiquement norvégienne. Voici le résultat. J´aime assez l´association osée du rouge et bleu sur le mur blanc. 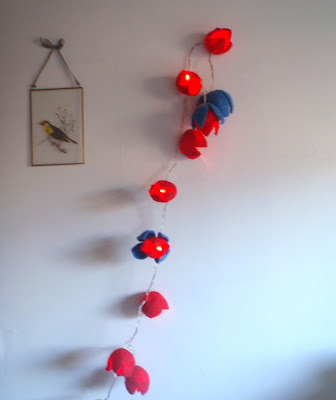 I love those felted lights. I'll have to check out your etsy shop. I was thinking about trying to make some for Christmas decorating this year, but I ran out of time and I wasn't sure how to do it. How do you get them to be 3D?